California Caster offers our most popular wheel. The Eagle stem wheel is made of solid polyurethane with a polyolefin core. This wheel handles higher load capacities than steel wheels and has a tread that will move across virtually any surface. It comes in multiple sizes with a sleek blue finish. 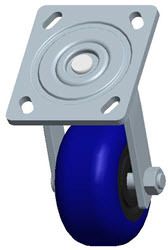 The Eagle stem caster wheel is a newly designed polyurethane tread on polypropylene core wheel. Its’ uniquely patented interlocking tread design offers superior adhesion that allows the Eagle wheel to achieve higher load capacities over other conventional wheels of similar design. These wheels are ideal for most any industrial application.The Eagle stem caster wheel is offered as plain bore, delrin, roller, or precision bearing. The standard tread color is blue. This series is the everyday workhorse of our caster line. Combined with the Eagle wheel, it is clearly an industry leader in performance and load rating. These casters are ideal for medium – heavy duty industrial applications. Many of our Eagle Stem Caster Wheels have 3D Models available for download in most formats, including IGES, STEP, PRO/E, and SolidWorks.